Elena Jane “Ellie” Goulding. After what seems a long break in the UK charts, it’s rumored that in October 2012 you Goulding’s will be blessed with a Shiny new album ‘Halcyon’. In an interview recently at the ‘Elle Women in Music Event’ she claims, her new album will have a different sound to her debut Album “Lights” and her Ex Boyfriend (Skrillex) has no influence on it at all.(1). Her birth place Kington near Hereford will always be home to Ellie. However it seems the US is now her 2nd home. Her single ‘Lights’ went to number 5 on the Billboard 100, in March 2011. I caught up with Ellie in 2010 and wished her well with the new album, and did she enjoy Beach Break? “Thank you. I’ve really had an awesome time here at Beach Break, the crowd was amazing. The weather has been great. It’s such a nice location to play, Like a home to my roots kind of gig”(2). Ellie Goulding has come a long way since winning the critics’ choice award at the Brit awards in 2010. She signed to Polydor Records in 2009, when her debut EP was launched into the market under the name ‘An introduction to Ellie Goulding‘. Just a few months after that March 1st 2010 her Debut studio album “Lights” was launched and went number 1 in the UK album charts. From this she had an array of festival appearance’s such as the well known Glastonbury festival, Beach Break Live, V festival, T in the park and Bestival to name just a few. In 2011 she even performed at Kate Middleton and Prince William’s wedding reception, and sang her take on “Your Song” and some of her other ever popular tracks such as “Starry Eyed”. 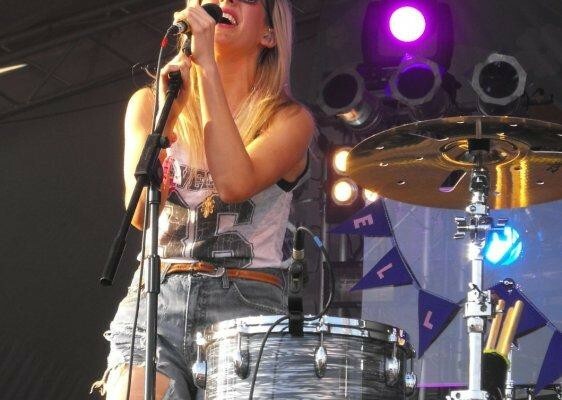 She joined Katy Perry on her 2011 US Tour, And Featured on Tinie Tempah’s hit “Wonderman”. In 2012 Ellie released a brand new tune ‘Hanging on’ Featuring Tinie Tempah. How the tables have turned! “It’s going to be even more emotional” (3) bring it on. This entry was posted in Reviews and tagged Ellie Goulding, Halcyon, starry eyed. Bookmark the permalink.